The Best Things to Visit in Town and Around the Area. The Must Taste Typical Food Specialities. Enjoy our Portovenere Photo Gallery. The town has ancient origins and takes its name ( Portus Veneris ) from a temple dedicated to Venus, which was located exactly where the Church of San Pietro now stands. The name was probably chosen because of the fact that, according to the legend, the goddess was born from the foam of the sea , abundant just below that cliff. The town was a Byzantine stronghold in mediaeval times but in 643 AD, was destroyed by King Rotari who had extended the Longobard dominion to maritime Liguria. The town grew again over the next centuries thanks to the monastic movement, which initially occupied the nearby islands of Palmaria and Tino . Portovenere was conceded by the Da Vezzano family in 1113 to the Genoese, who developed the military and marine potential of the town and built the fortified town as we see it today: the characteristic row of tower-houses along the waterfront, the city walls with its three towers, the town gate, Doria Castle , San Pietro Church in 1256, as a token of gratitude for the decisive contribution of the local inhabitants in the conquest of Lerici and, between 1118 and 1130, the church of San Lorenzo . With the refinement of the long-range guns began the military decline of the village as it lost its "invulnerability" due to its entrenched position, however Portovenere continued to be an important port in the routes of commercial shipping. Following the arrival of Napoleon in the Gulf of Spezia and the proclamation of the New Ligurian Republic, August 1, 1791 , began another period of oppression for the town under the occupation by Austro - Russian and French armies who severely damaged the two churches. 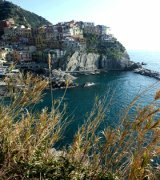 Send a free Portovenere e-card from LiguriaGuide.com . Click here to share Portovenere's charm ! At the end of the nineteenth century began a period of restoration work which continued steadily and has allowed the preservation of " ... an area of exceptional cultural value , which shows the harmonious relationship between man and nature which must be a landscape demonstration of extraordinary scenic beauty of a traditional way of life that has persisted for a thousand years and continues to play an important role in socio-economic life of the community " - the reasons for which Portovenere and its surrounding areas have been included in the UNESCO World Heritage List . At the far end of the piazza you can admire the ancient town’s gate which leads you through the city walls into the narrow carrugio (alleyway called Via G. Capellini) that goes through town. The alleyways offer endless possibilities to taste and buy local delicatessens the likes of focaccia, fresh basil and fish as well as local souvenirs. You can make a sharp turn to the right after the town’s gate and start the steep ascend of the stairs leading to the magnificent Doria Castle of Portovenere . Do remember to stop and turn around from time to time to admire the charming views that open up over the Gulf and the Island of Palmaria . The path goes through the upper part of the village, passes close to the bell tower of the San Lorenzo Church and opens up onto the shady terrace just below the Castle. This is an ideal place to take a break and enjoy a picnic while admiring the views over the Bay. Once you are rested you can go up to the Doria Castle and take a tour around its grounds. From this high point, you can see the Island of Palmaria in all its glory as well as splendid panoramic views over the promontory where sits the San Pientro Church and the Byron’s Cave. 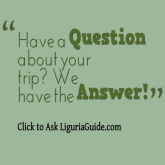 Send a free e-card from LiguriaGuide.com . Click here to share town's charm ! From the Castle you can start your descend taking the path on the right which leads to the San Lorenzo Church . The church was erected on the rocky hills at the centre of town and was considered the official cathedral of the colony. And inside it, today we find several great works of art: a 15th –century triptych, the St. Martin Polyptych, as well as the wonderful parchment of the Madonna Bianca (White Madona), for whom Portovenere’s citizens have a sacred admiration. Continuing your descend through the narrow alleyways, you will start taking glimpses of the beautiful black-and-white Romanesque San Pietro Church which sits atop a buried Roman temple at the peninsula’s extremity. You will come to Piazza L. Spallanzani, which leads the way to the San Pietro Church as well as the Arpaia Cave, affectionately called Byron’s Cave. The ubiquitous Lord Byron was a regular here and was captivated by the beauty of the area as was fellow poet Shelley, who drowned while trying to swim here from Lerici. 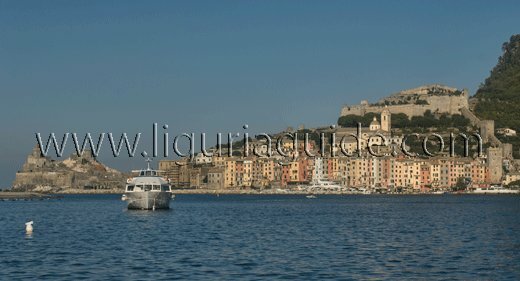 Send a free Portovenere e-card from LiguriaGuide.com . Click here to share the town's charm ! Apart from sightseeing around town, the surrounding areas offer a wide variety of activities – swimming, canoeing, windsurfing, hiking, snorkelling, diving and climbing. Much of the territory of the municipality of Portovenere is in fact part of the Regional Natural Park of Portovenere which has an area of around 400ha and includes the hilly cape as well as the islands of Palmaria, Tino and Tinetto. The itinerary formed by the paths of the Club Alpino Italiano ( Italian Alpine Club) leading to the Cinque Terre – path No.1 starts from Portovenere and affords panoramic views that are among the most charming on the whole Riviera. The area attracts visitors not only with the variety of beautiful nature trails but also with is amazing diving and climbing spots. The Muzzerone and its cliffs are now one of the most loved and visited by thousands of climbers from Europe and around the world. As you would expect the sea, in addition to affording a charming seascape and as is the case with the other villages along the Gulf, has marked the life of Portovenere and its citizens who are considered to be expert fishermen. All local specialities are therefore characterised by products typical of the sea. Visiting the area you cannot but notice the mussle breeding areas off the Island of Palmaria and Portovenere - activity which began at the end of 19th century. Today Portovenere's mussles are renowned delicacy and are cooked at restaurants in a variety of ways: with spaghetti, fried, stuffed and marinara. In addition to shellfish, octopus is another speciality of the area and if you have the chance you should try the excellent octopus salad seasoned with local olive oil and aromatic herbs. The octopus is abundant here due to the high concentration of plankton in the waters off the town's shores. If you are passing through the village of Le Grazie , make sure to try the sea breem which they breed using a well-tried technique. To see images and photos of the roads in the map, click Golfo dei Poeti and then click on the little person figure above the + zoom option and grad it to the map. For example, place the little person figure (shown on the right) over Via Olivo and see the main road leading to the village… For even more fun and pictures, as well as to get a real feel for the area, view the map in Google Earth by clicking on the "View in Google Earth" option above the map.